2017 was a big year for us here at The Faits. In January, we participated in two wedding shows with The Elegant Bridal Expo where we met lots of prospective couples including some of the ones you see below. It was such an amazing time to see all the excited couples planning their weddings. And speaking of planning weddings, on April 1st, we officially became The Faits by tying the knot ourselves! We can now say we DEFINITELY know what it's like to plan a wedding in Central Illinois, and it has been a pleasure to share in that newlywed joy with our couples. Enough about us - let's get on with it! On the coldest day of what promised to be a warm week, we met Megan and Kyle on the Peoria Riverfront for some outdoor engagement photos. The couple braved against the chill by snuggling up and sharing a lot of laughs. We knew then that their wedding would be one we would remember! Megan and ­­Kyle’s wedding was a glamorous blush and navy affair with elements of small town sentiment. We absolutely loved the ceremony in the hometown St. Patrick Catholic Church in Minonk, the quick stop for drinks at a unique local establishment, and the fun-filled reception at Packard Plaza in Peoria! From the beautiful ceremony to the hilarious mixup during toasts, to the photo booth and dance floor, it was easy for guests to feel like they were part of an incredible beginning to a happy marriage. Matt and Allison both serve in the armed forces as pilots, but when we couldn’t get access to aircraft for their engagement session, we settled for the next best thing – the tanks at Cantigny Park! It was so great to be able to incorporate such a neat part of their story – after all, they met during their time at their university’s ROTC program. When we were contacted to shoot Lori and Mike’s unique wedding-slash-baby baptism, we jumped at the opportunity. Being storytellers at our core, it was truly an honor to preserve such a unique part of this little family’s life. The ceremony was filled with lots of touching moments as the couple stood, surrounded by the closest members of their family and friend groups. Mike and Lori spoke their vows as they were showered with love and prayers during the intimate ceremony at the historic Shrine of Our Lady of Pompeii in Chicago. From the moment we met this couple, we knew they were something special. For example, Sarah had actually proposed to Phil via a Pokemon-themed scavenger hunt through their apartment! Their engagement session at Luthy Botanical Gardens was filled with lots of laughs and personal touches like the Red String Of Fate. Their wedding took place at the stunning Ewing Manor and Cultural Center in Bloomington. The ceremony was the perfect balance of touching moments and laughter, like when Sarah managed to Rickroll Phil in the middle of her vows. After a quick dress change, guests danced the night away in the courtyard. Chris and Rachel's wedding took place outside Champaign - Urbana at the gorgeous Pear Tree Estate. Rachel looked stunning in the strapless dress that showed off her sleeve of colorful tattoos, and Chris looked sharp in a navy suit. The couple exchanged vows on the patio before taking the party inside for dinner, drinks, and dancing all night long. When we met for their engagement session, Jon and Sonja blew us away with the amount of natural chemistry and laughter between them. Being native to the Illinois Valley, they opted for an engagement session at the historic Starved Rock State Park with its scenic natural views. Their wedding was just like the engagement session - filled with lots of Sonja's personality and Jon's loving smile every time he looked at her. The two said vows at St. Ann's Catholic Church in Toluca before taking a hayrack ride with their wedding party back to the reception, hosted at a family farm. 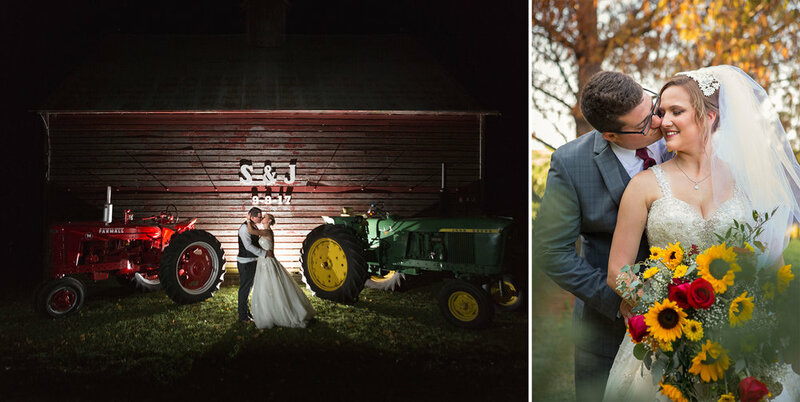 The rustic touches, friendly International Harvester vs. John Deere rivalry, and perfect weather made for a lovely fall wedding in the Illinois Valley. During their consultation, Alicia and Steven told us about the first night they met - the two went for a walk, and ended up climbing into a tree where they sat and talked for hours. We loved being able to include this part of their story into their engagement photos, taken during their session in Eureka. 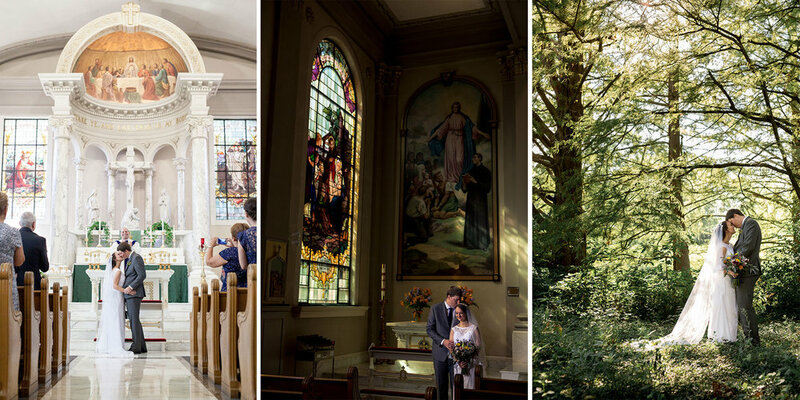 The couple wed in the gorgeous St. John's Catholic Newman Center on the campus of their alma mater, University of Illinois in Urbana, and returned to the spot of that first long night of talking in the U of I Arboretum for their formal portraits. Nick and Kyla opted for a unique approach to their engagement photos as a way to include multiple parts of their love story. Since Nick proposed during the winter, aided by Christmas lights, they had a mini session in Uptown Normal amidst the holiday lights. Later, when the weather warmed, we met for a second session at one of the volleyball courts where the couple spent summers getting to know each other over spikes and serves. If rain on your wedding day is good luck, Nick and Kyla will have buckets of it. What was supposed to be a lakeside ceremony was quickly moved into the reception tent due to one of the most rainy wedding days we have ever seen! It hardly seemed to phase them as they said their vows under the pergola Nick had built for their ceremony. The sun came out just in time for portraits before a night of dancing and fun. Elizabeth and Damien's wedding was a little different from the typical formulaic wedding and we loved every part of it! After the birth of their first daughter, Elizabeth said that she and Damien would get married before they had a second child. With the announcement of their second pregnancy came plans for a wedding, and we love how she embraced her baby bump during her bridal portraits! After couples portraits at the beautiful Pearl Brasserie (Formerly Coogan's) where the two met, Elizabeth and Damien exchanged vows during a handfasting ceremony at Carnivale in Chicago - a colorful restaurant in the heart of the city. Guests enjoyed amazing Central and South American food, dessert and dancing in the Windy City. That wraps up our amazing 2017 wedding season! We are so thankful to all the couples who trusted us to tell their love stories and be a part of their celebrations. Over the next few weeks, we will be sharing more blogs about some of the weddings you see here as well as the engagement sessions of some of our amazing 2018 couples. If you're looking for a wedding show to attend, we'd love to see you at The Elegant Bridal Expo in Bloomington on January 21 or Weddings of a Lifetime in Peoria on January 26 & 27. Wishing you all the very best in the new year! The Faits is made up of Laura and Evan Fait, a husband and wife wedding photography team with an emphasis on storytelling. While located in Peoria, Illinois, they serve the Central Illinois area including Bloomington Normal, Ottawa, LaSalle Peru and are available for travel. As photographers, they strive to create photos that are creative, personalized, and unique as each couple’s love story.